Ron was in the 517th Maintenance Unit, which consisted of approximately 278 men. They were known as the Seabees. 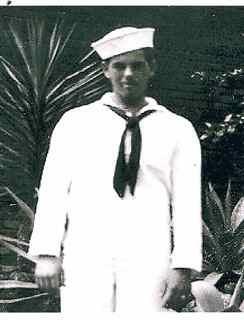 He spent 68 days on an LST Landing Ship headed for Bora-Bora, which he considered the “most beautiful island in the Pacific.” Throughout the war, Ron was on over 23 different islands and never was more than two degrees north or south of the equator. Most of Ron’s work was stevedore work, building causeways between islands and dredging out shipping lanes for ships to come and go. His unit built airports, roadways and post offices. After work, Ron collected live shells by diving on the coral reefs and then creating beads and jewelry. Towards the end of the war his outfit went to all the islands to salvage everything was was useable. They transported it to the piers to ships and then blew up everything that wasn’t collected. Unbelievably, Ron didn’t draw any pay while in the service.